As part of the Britain on Film series presented by the BFI, C Fylm will screen documentary film maker Molly Dineen’s film The Lie of the Land and invite members of the food, farming and film making community to join in a discussion about how the countryside and food production is changing as a result of collective action. In The Lie of the Land, Molly explores the realities of life as a British small holder farmer in 2007 . 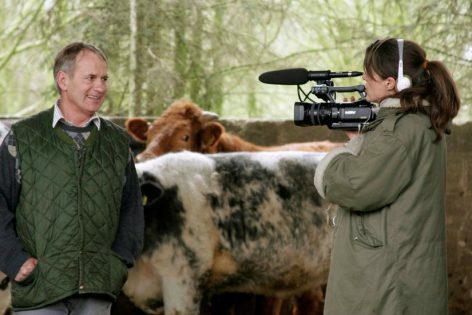 The film examines our contradictory relationship with nature; the harsh realities of its cycles of life and death; and the consequences of our desire for increasingly cheap food, and the future of small farms – a topical subject still. The film also follows long section portraying farming and country pursuits on the Lizard at the time. Molly has directed more than ten films on a broad range of contemporary subjects, often focusing on changing institutions. Her films The Lord’s Tale (on the reform of the House of Lords), Geri – on the Spice Girl at the time of her departure from the band and Tony Blair during his election campaign of 1997 all precede The Lie of the Land. In 2003 Molly won The Grierson Memorial Trust Trustees’ Award for her outstanding contribution to the art of documentary.